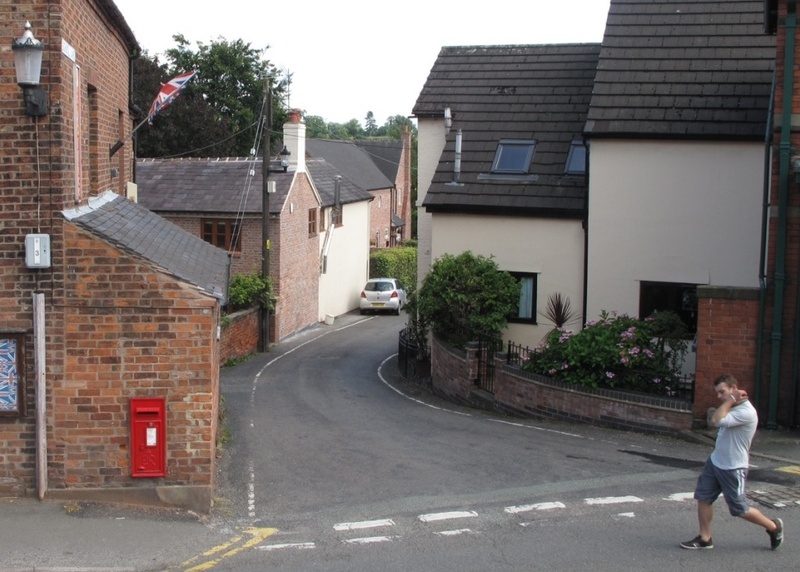 Audlem is quite the beauty spot with its canals, painted narrow boats and mix of historic buildings. 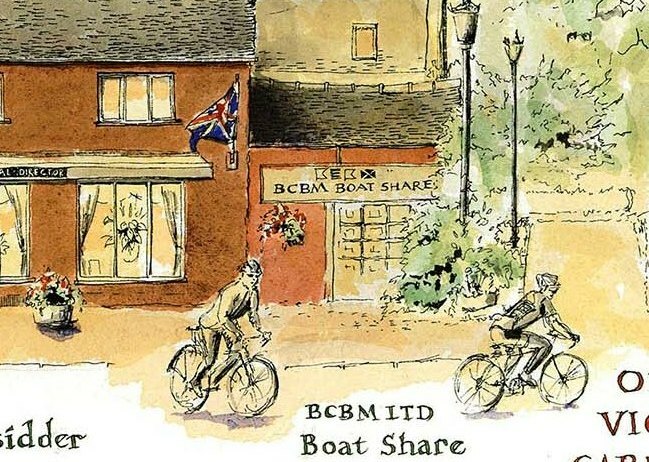 We took all our visiting relations there when we lived in Alsager and later on from Whitmore; it was a great destination any time of year. 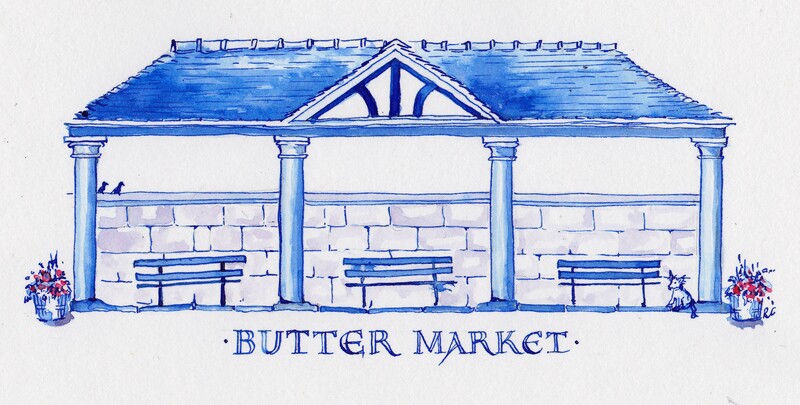 We had all grown to love this place so it was an easy choice to draw the main high street – some five years ago now. 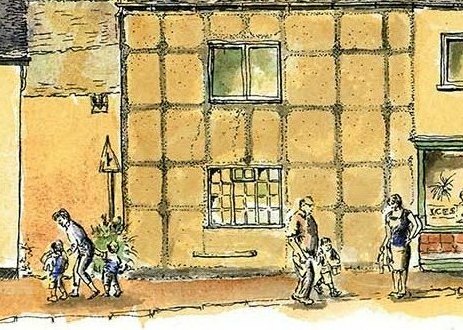 I include figures in my drawings as they are the life of the street. I take photos of the buildings and whoever is passing by at the time gets drawn in. 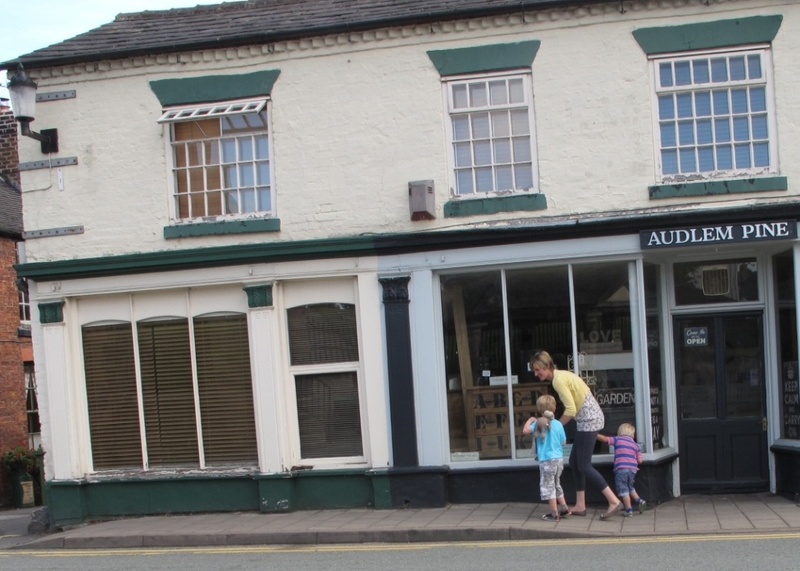 Sometimes I find out about them later – like I discovered that the gentleman here at the door of Williams is Derek Mckelvey, so much part of the history of Audlem and a delight to meet and chat to when I called in to the shop. I was very sorry to learn he passed away early in the New Year. My condolences to all the family and the community as they say their goodbyes. Sunny day in August 2013 – a passing moment when Derek was at the door. 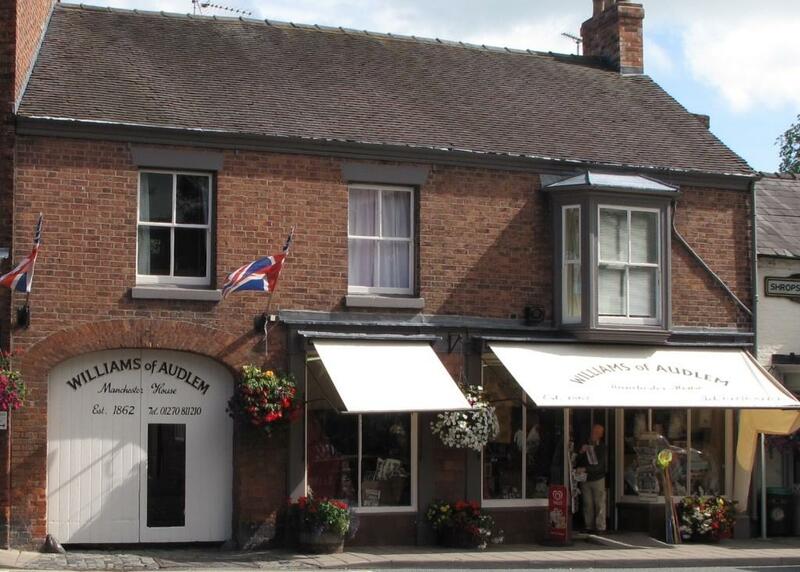 Williams of Audlem have been present in Audlem town centre for 155 years. Recently, they have brought a wonderful treasure back into pride of place on their recently fitted antique counter. It’s such a great piece of crafted woodwork that I sketched some of the details below. There is a guarantee tucked away in the drawer with Judy’s grandfather’s name handwritten up at the top. It appears he got it from 225 Tottenham Court Road London, in 1913, which is now home to the Nationwide Building Society. There is a possibility that this was a reconditioned cash register imported from Daton, USA. Can’t see any pounds or shillings but plenty of pence! 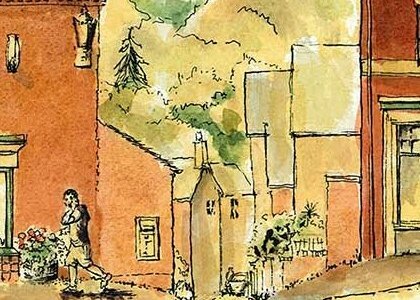 You can see the rest of the Audlem street scenes here on my website Drawing the Street and Judy stocks signed limited edition prints of all the Audlem street scenes which I have drawn so far. 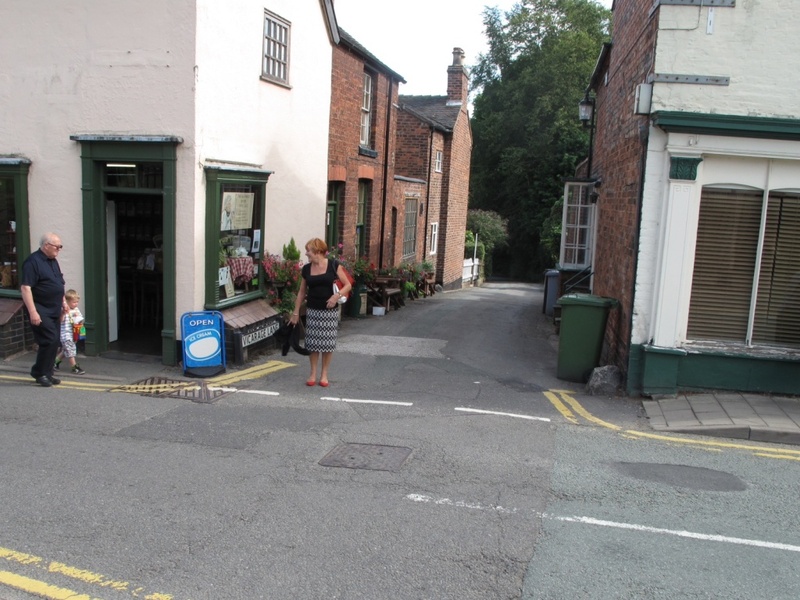 Pop in and say hello – there is always a warm welcome from Judy or Olive! 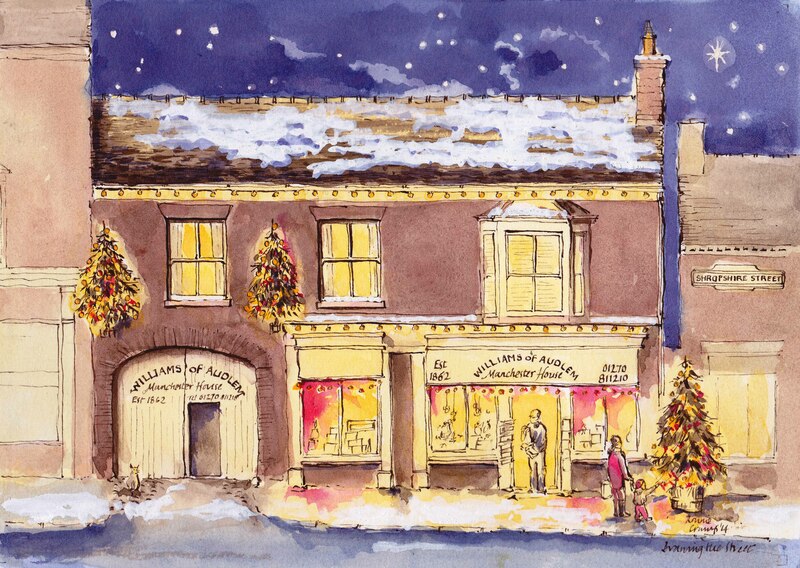 October was a bit premature to share what was on my drawing board at the time – snowy scenes of some of Audlem’s delightful shops. 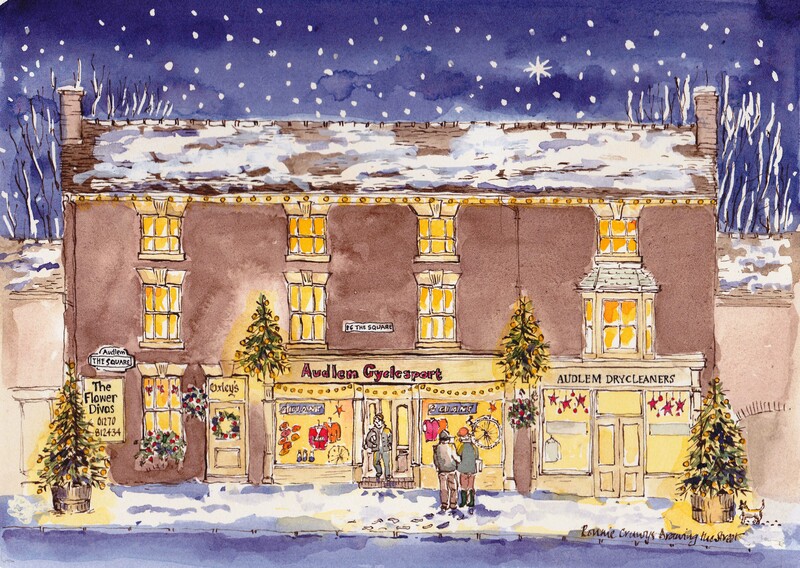 Now that we are into Advent and the temperature has fallen, it feels much more timely to share the images which are now on sale as Christmas cards at Williams of Audlem. Pop in to Williams and say hello to Derek! Following on fromm my last blog post, here’s the finished tea towel – a great Christmas gift and easy to post! On sale at Williams of Audlem, Cheshire. 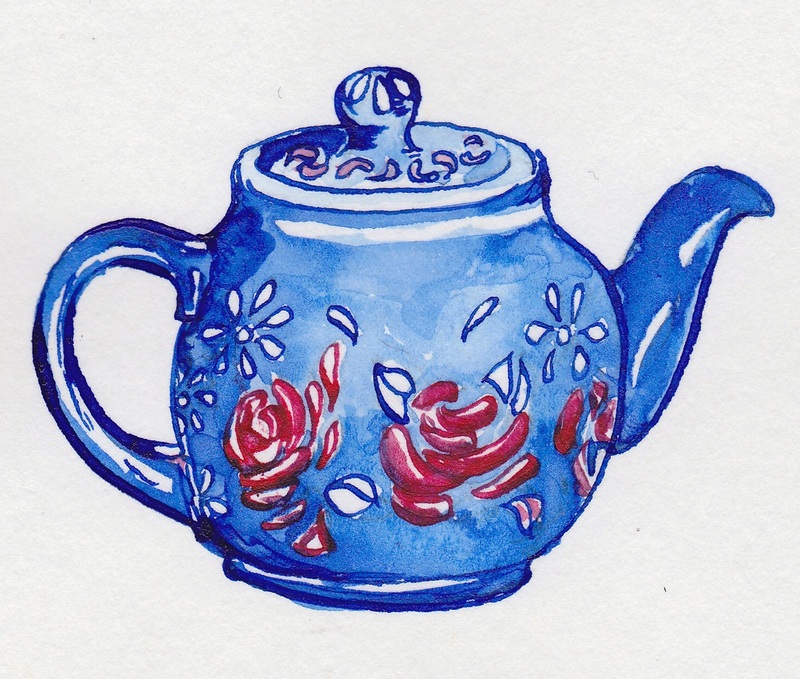 Whenever I finish a drawing, I scan it as soon as possible as the original often represents over a hundred hours work. 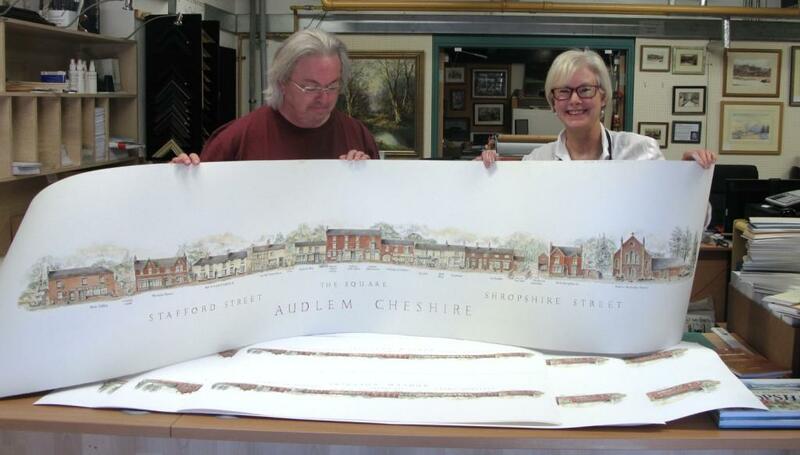 Given the size of the drawings (the Audlem drawing is 2 metres long), the scanned file sizes are huge as I scan with a high resolution for the best quality prints and so that enlargements on to canvas can be made for festival banners. The street drawings are non-standard sizes so there are not many printing firms that can handle this combination. 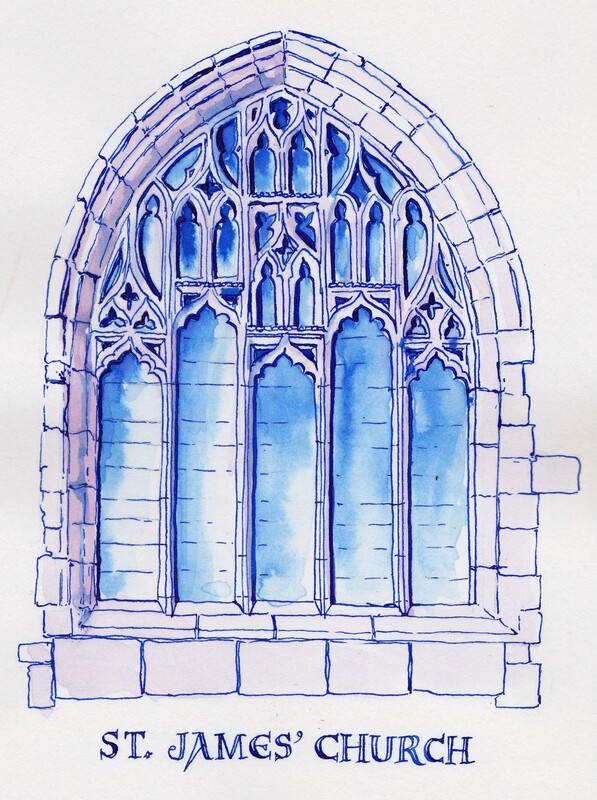 That said, Smith York in Ironbridge is a place where Simon not only can scan, but he also makes adjustments to the scanned image in order to reproduce the best quality giclee prints on heavy watercolour paper. 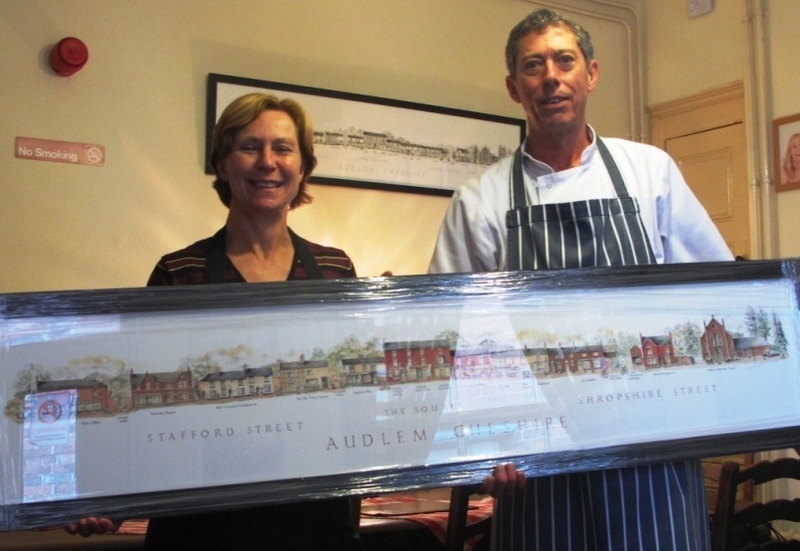 Jane and Andy with the large size framed print of the Audlem street scene – soon to go up on the wall of the cafe. The first few limited edition prints are now ready and for sale. 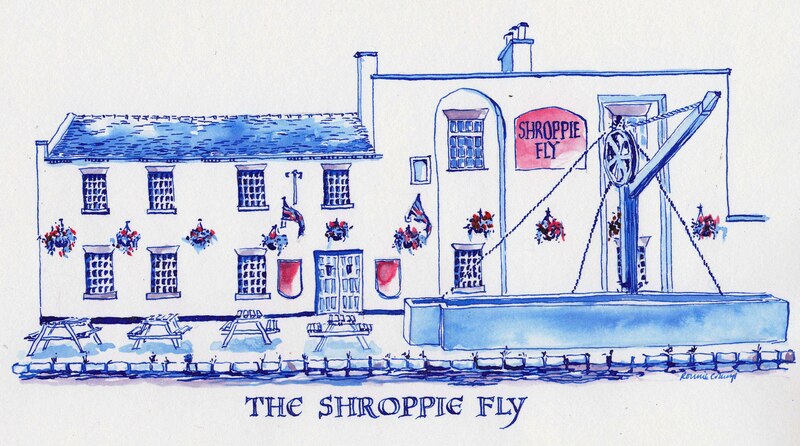 I took the first framed large colour print along to Jane and Andy who have been running the Old Priest House in Audlem for almost twenty years. 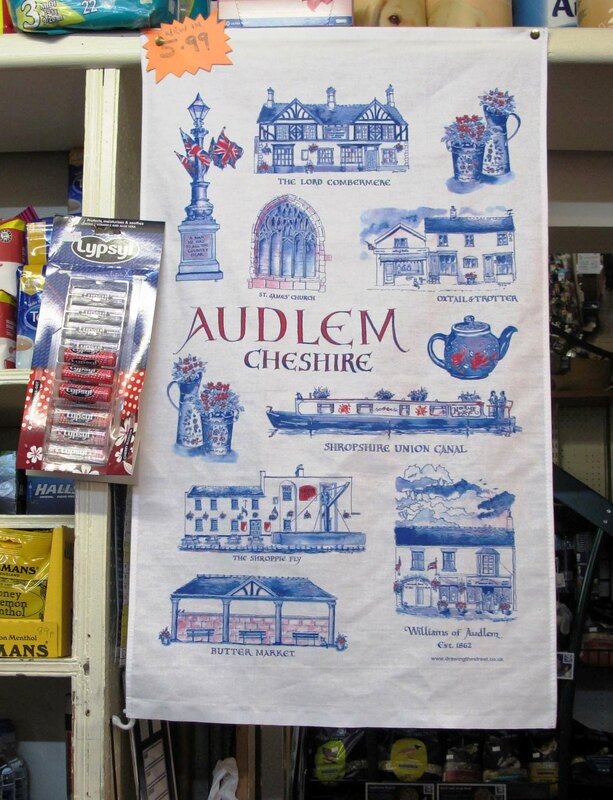 As Jane herself has been included on the drawing, it’s a great keepsake for friends and family of the part they have played in Audlem life. Thanks to you both for providing us with a top destination for many a sturdy breakfast! When I set out to draw a street, I make thumbnail sketches and take photos. 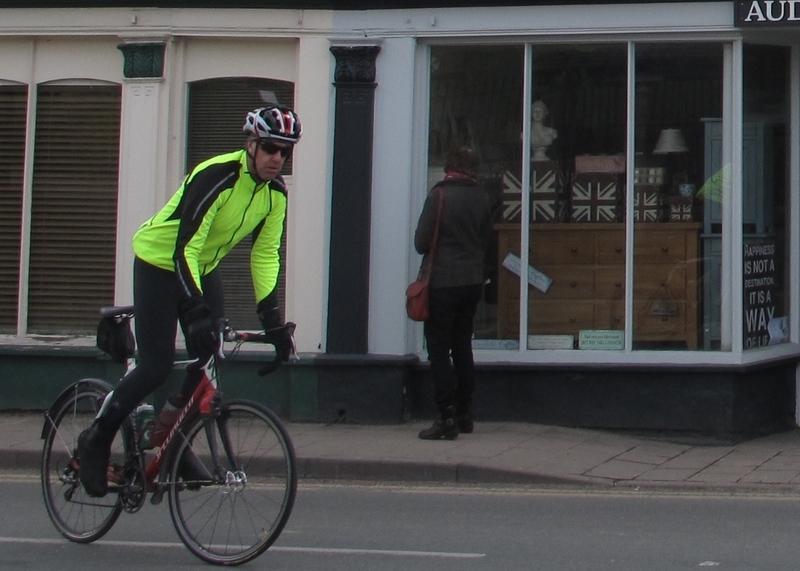 Inevitably, I photograph a few passers-by and I like to draw them too as they are an important part of the streetscape. It crossed my mind that people may wonder if they have been included on a drawing so here are a few photographed faces and the corresponding sketches. 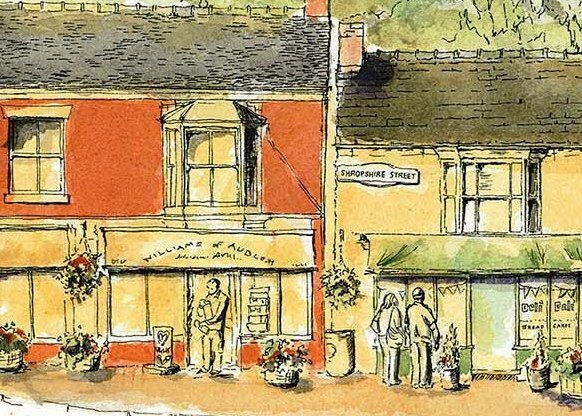 Set within the lovely group of buildings known as ‘The Square’, there is a shop which has been in the same family since 1862 – it’s Williams of Audlem. 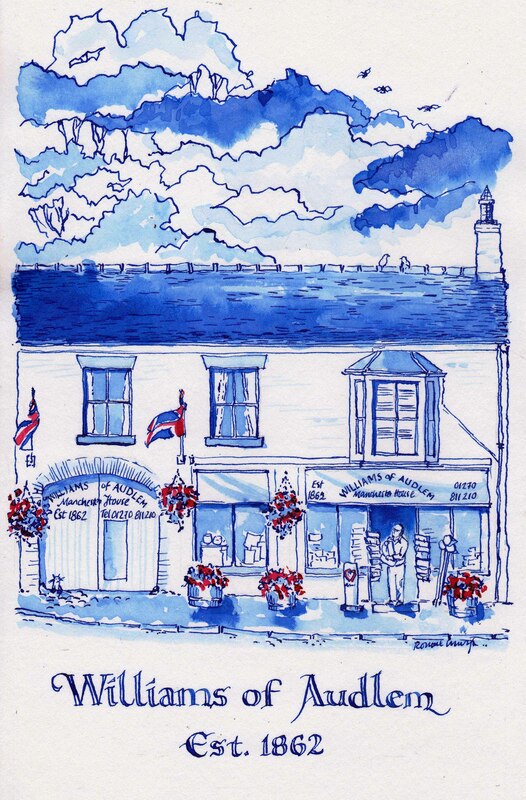 I particularly like the sign-writing on the awnings and doorway – and the attractive flower baskets and flags all add up to it looking very elegant indeed. 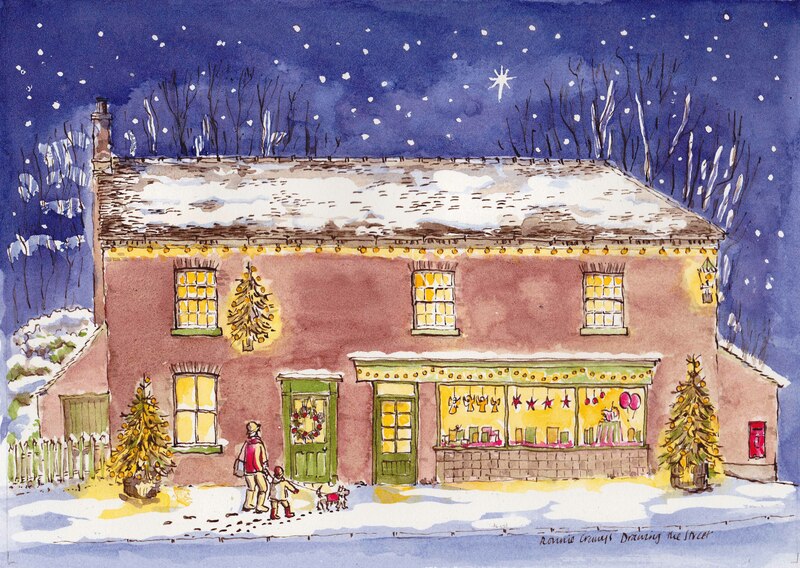 Williams of Audlem and the Old Priest House are stocking limited edition (100 total) prints. If you would like to buy an unframed colour print, prices are as follows: small (800mm long) £95, medium (1200mm) £135 and large (1500mm) £175. 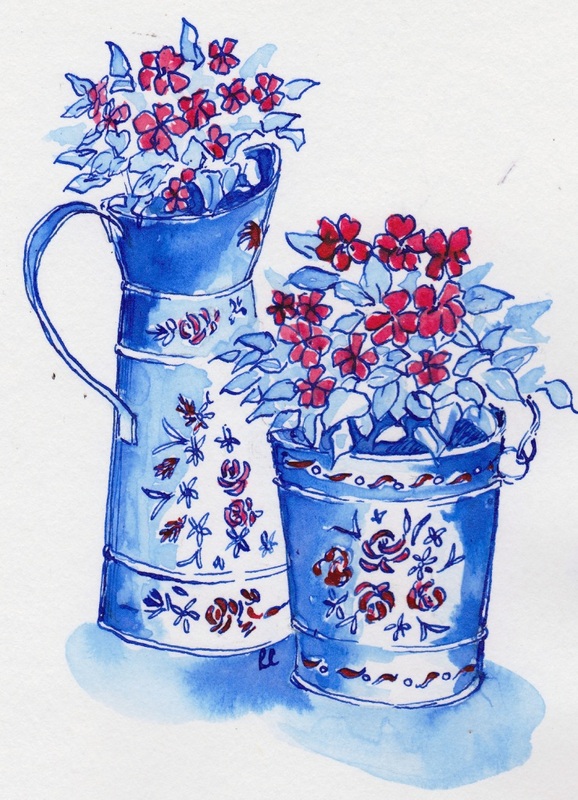 The prices reflect the quality of the print, the work involved in the drawing and include a commission to the trader. 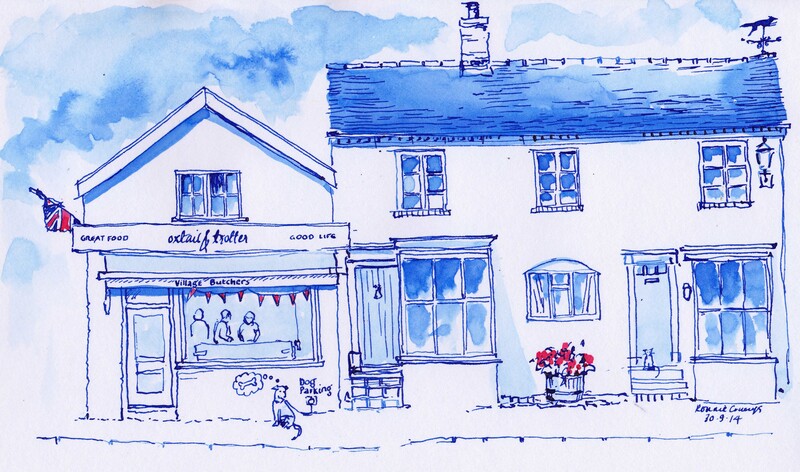 So, if you buy a print, you also support your local high street! 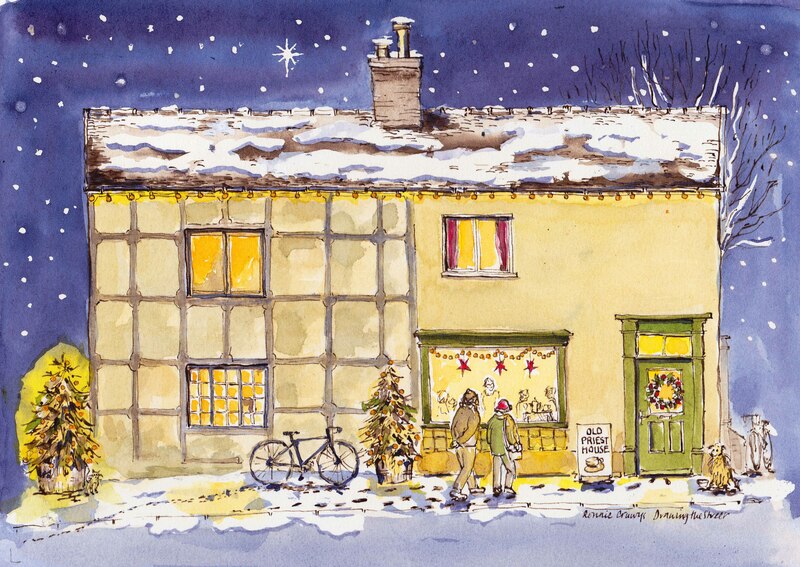 There are also a selection of postcards from the drawing avaiable for sale. Please dont hesitate to contact me if you would like to reserve a print.